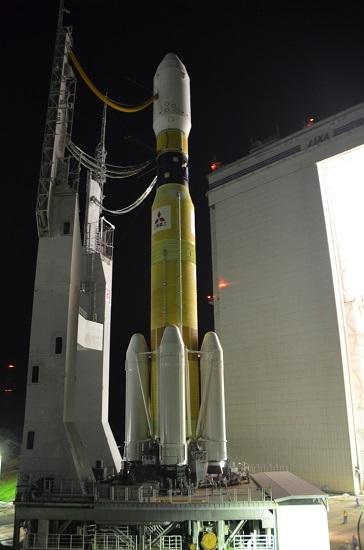 Mitsubishi Heavy Industries, Ltd. and the National Research and Development Agency, Japan Aerospace Exploration Agency (JAXA) decided to launch the H-IIB Launch Vehicle No. 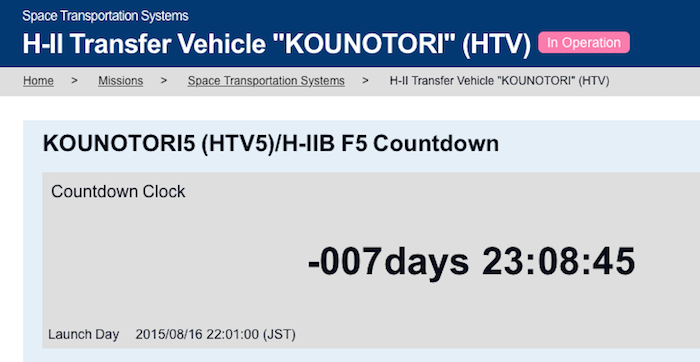 5 (H-IIB F5) with the H-II Transfer Vehicle "KOUNOTORI5" (HTV5, a cargo transporter to the International Space Station) onboard in the following schedule. (*1) Time will be determined by the updated orbit of the International Space Station (ISS). TANEGASHIMA, Kagoshima Prefecture--Japan’s space agency unveiled the Kounotori 5 (HTV5) unmanned transfer vehicle July 1 that is being readied for a mission to resupply the International Space Station (ISS). The Japan Aerospace Exploration Agency (JAXA) cargo vessel will be carried by an H-2B rocket that will be launched from the Tanegashima Space Center on Aug. 16. It is expected to dock with the ISS around Aug. 22, the agency said. 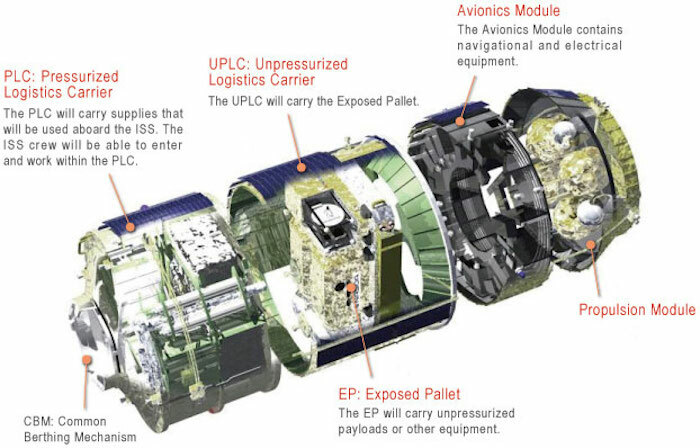 The vehicle will bring supplies, such as food and water, as well as the equipment and materials for experiments, to the ISS. The Kounotori 5 is 10 meters long, 4.4 meters in diameter and has a maximum cargo capacity of 6 tons. 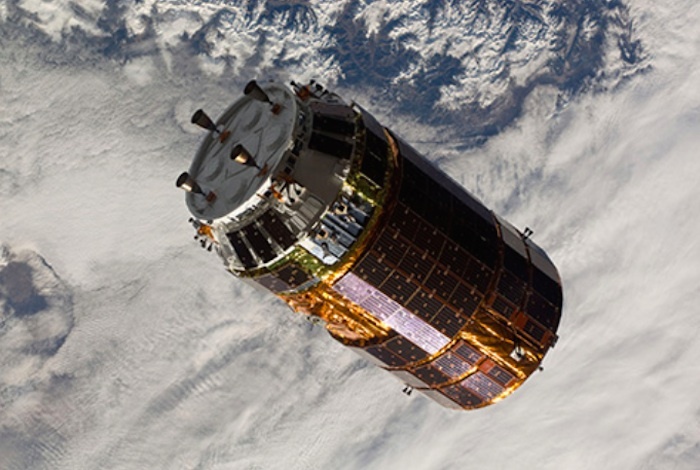 Japan, the United States and Russia are responsible for cargo deliveries to the ISS. 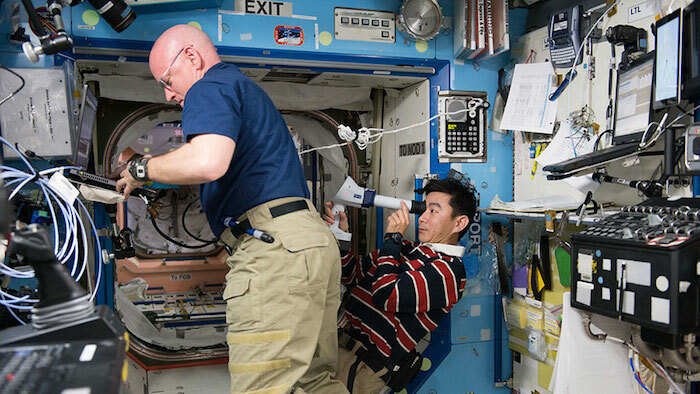 ISS044E033352 (08/05/2015) — NASA astronaut Scott Kelly (left) assists Japan Aerospace Exploration Agency (JAXA) astronaut Kimiya Yui (right) with measurements for the ongoing Ocular Health study. The International Space Station experienced a temporary power loss Tuesday night while backup systems maintained power to critical systems. Power was restored quickly and there were no impacts to station operations and the six-member crew was always safe. Astronauts Kjell Lindgren and Kimiya Yui are training for the robotic capture next week of Japan’s fifth “Kounotori” HTV cargo ship (HTV-5). 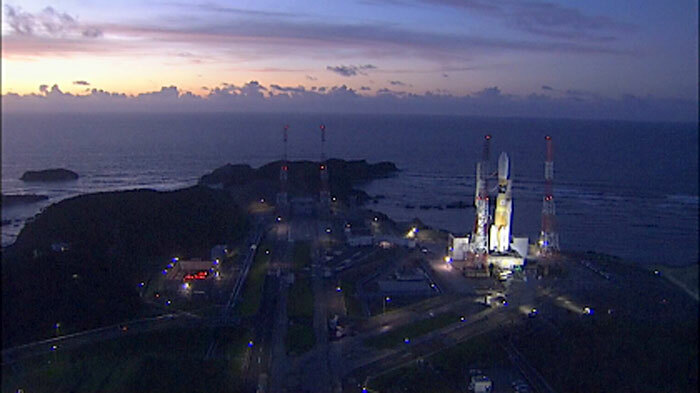 The HTV-5 will launch from Japan’s Tanegashima Space Center Sunday morning and take a four day trip to the station. The duo will be inside the cupola Aug. 20 to capture the HTV-5 with the Canadarm2. Lindgren also checked on U.S. spacewalk tools while Yui cleaned and inventoried gear inside the Japanese Kibo lab module. Cosmonauts Gennady Padalka and Mikhail Kornienko are cleaning up after Tuesday’s 5-hour, 31-minute spacewalk. The cosmonauts also talked to Russian spacewalk specialists on the ground Wednesday about the previous day’s external activities. 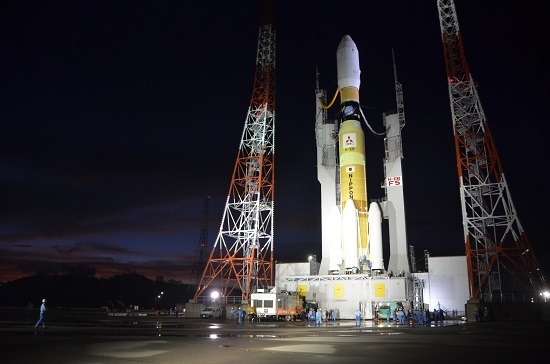 Mitsubishi Heavy Industries, Ltd. and the Japan Aerospace Exploration Agency (JAXA) decided to postpone the launch of the H-IIB Launch Vehicle No. 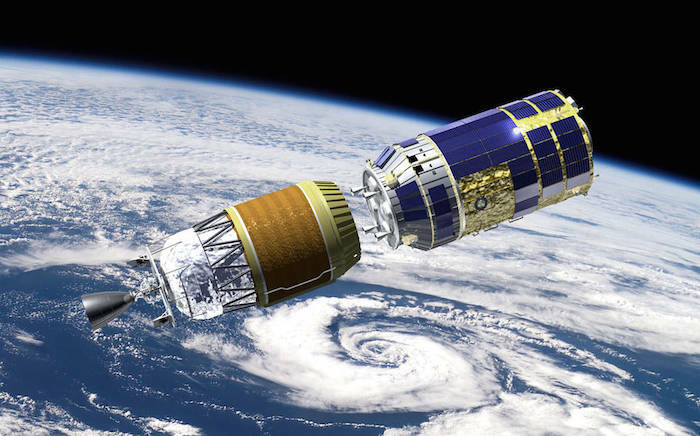 5 with the H-II Transfer Vehicle “KOUNOTORI5” (HTV5) onboard from the Tanegashima Space Center, which was originally scheduled for August 16, 2015 (Japan Standard Time), as unfavorable weather is forecasted. The new launch date is set for August 17 (Mon. ), 2015 (JST). 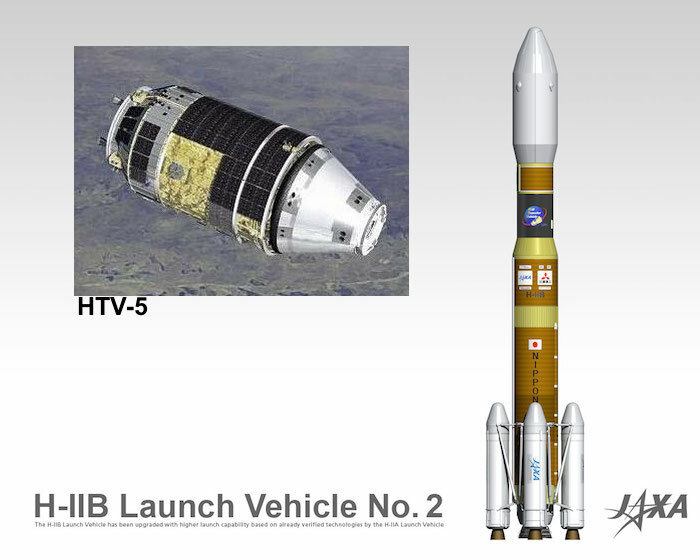 This artist's concept shows the Japan Aerospace Exploration Agency's (JAXA) H-II Transport Vehicle-5 separating from its H-IIB launch vehicle. 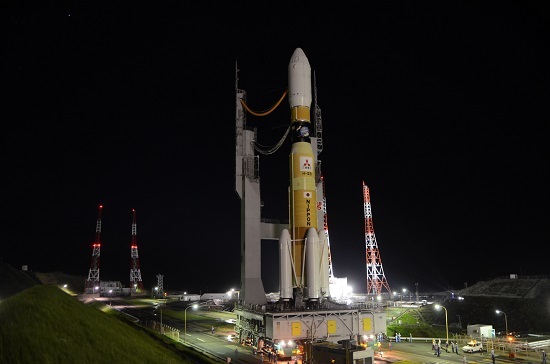 JAXA is delaying the launch from the Tanegashima Space Center in southern Japan due to an unfavorable weather forecast at the launch site for the next two days, which may delay the launch date further. Loaded with more than 4.5 tons of supplies, including water, spare parts and experiment hardware for the six-person space station crew, the unpiloted cargo craft, named Kounotori, Japanese for “white stork,” will travel five days to reach the station. Rendezvous and grapple of the HTV-5 now is scheduled for approximately 6:55 a.m. on Monday, Aug. 24. 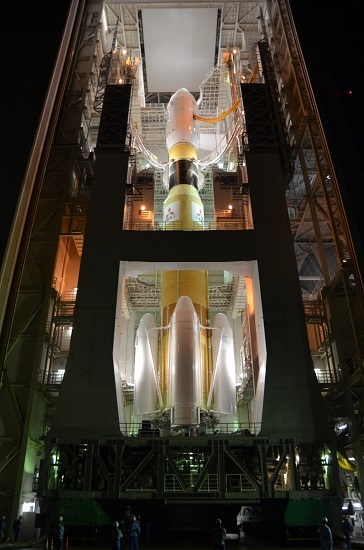 NASA TV coverage will begin at 5:15 a.m. Installation coverage will now begin at 9:15 a.m. for installation at approximately 9:45 a.m.